The new book by artist Claudia Trimbur Pagel.Signed books. Claudia says"I am addicted to books! 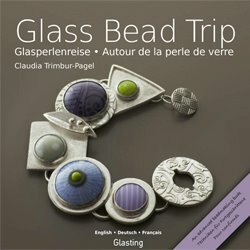 I just can’t resist a new book about glass or jewellery. Publishing my own one is a long time dream that I have nurtured for the last few years, but first I had to define a concept for it. I wanted to share techniques for intermediate to advanced lampworkers as if I were sitting right next to them in a classroom, but also document those techniques as nicely as possible with photography of lampwork beads and jewellery. Finally, just like a lot of my actual teaching, it had to be in three languages (English, German and French)"